The following Carrier Infinity Furnace Price was submitted as part of our Share your Price form. Michelle, was somewhat suprised when she saw the first Carrier Infinity furnace price, but quickly realized the quality of the system! Our story was actually very similar to the reader who submitted the Carrier performance price a few weeks ago. Our central ac was fine and we just needed a new gas furnace, which was 17 years old. We chose to get a Carrier Infinity price, based on the recommendation of one of our neighbors, who also owns a Carrier infinity. Installation took 3 guys, 5 hours. We live in Northern Virginia and have 6-7 months of heating the home to deal with, so we really wanted to have a high efficiency gas furnace we could count on to deliver cost savings over its life. “We Know a Guy”… as they say, who works in the trade and he said that Carrier and trane are really head to head when it comes to quality of their systems. He recommended the Carrier Infinity furnace. Overall, I think we had 2 separate visits from the company who handled the installation. The first visit was due to the blower not working on the air conditioner! It turned out to be a bad blower motor but during the repair they found huge cracks in the heating element of the old system, and we decided to get it replaced while they are here. 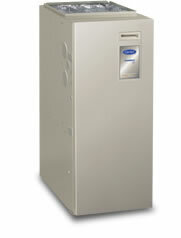 Do you have a carrier infinity furnace? If so, how about sharing your experience or price with us? Hi, Thanks for posting this info. I too live in N VA, and am looking to replace our aging furnace with a Carrier Infinity unit. But the couple of quotes I got vary significantly. It sounds like you had a pleasant experience. Would you mind sharing the name/contact of the contractor who did the work for you? I sent Michelle an email back and hopefully she sees your comment here. If she stops by I’ll be glad to reply with who she used for her HVAC installation.